Uggie, the Jack Russell terrier who became a canine star for his scene-stealing role in the Oscar-winning movie The Artist, has died. The beloved pooch was euthanized after a bout with prostate cancer. 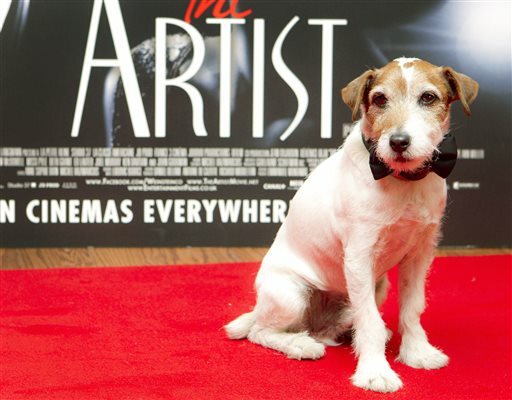 In The Artist, Uggie played the canine companion to Jean Dujardin’s fading silent-film star. The movie won Academy Awards for Best Picture, actor and director in 2011. His other screen credits included Water for Elephants and Mr. Fix It. He retired in 2012 in a ceremony at the famous Chinese Theatre in Hollywood, where he became the first dog to leave his paw prints in concrete alongside the prints of human stars. Uggie was a rescue dog, a cause that his owner championed. His owner made it a point to keep the dog in shape and feeling young with exercise, including using a treadmill. This entry was posted on Wednesday, August 12th, 2015 at 11:02 am	and is filed under Blog by Manny Pacheco. You can follow any comments to this post through the RSS 2.0 feed. Responses are currently closed, but you can trackback from your own site.